that were purchased after the tornado. The following is a brief timeline detailing some of the important moments in the department’s history. As more information becomes available, we will update it to include those moments in time. Village Board decided to install waterworks for fire protection throughout the village. 1000 feet of water mains were installed. 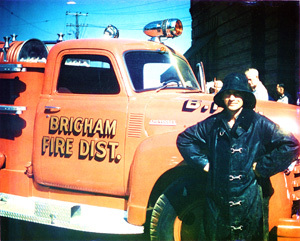 Town of Brigham bought its first new fire truck, a 1948 Chevrolet pumper tanker. Village purchased land and built a new village hall and fire station where the Buzz Inn is currently located. A group of firemen went before the Village & Town Board to request the Village of Barneveld to buy a new International Harvester (IH) pumper and the Town of Brigham to buy a new tanker. The proposal was approved while at the same meeting, the board decided to sell the old Stoughton pumper to Sun Prairie for $400. 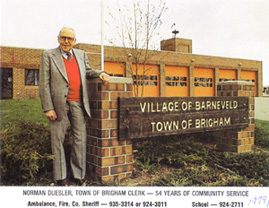 With the help of Norman Duesler and Loyd Henderson, the village received grant money to build a new municipal building where the fire department still resides to this day. At the time, the construction of this building cost the village $222,222, which was built by Daniels Construction Company out of Madison. 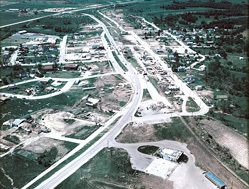 On Friday, June 8th, 1984, an F5 tornado wiped out approximately 90% of Barneveld. Homes, businesses, and the community were forever changed by that life altering event. Nine people died and hundreds more were injured by the tornado that devastated the village in approximately four minutes at 12:50am in the morning. When the dust settled, the community came together and chose to rebuild the town. Our motto was “We’re not giving up!” and we never did. 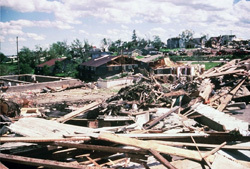 With help from people in neighboring communities and across the state, Barneveld rose from the rubble stronger than before, but to this day, June 8th, 1984 will forever be a defining moment in our community’s history. 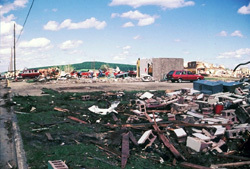 After the tornado, the Village of Barneveld and the Town of Brigham decided to form the Barneveld-Brigham Fire District. Instead of buying new equipment for the Town and Brigham and Village of Barneveld, the Village Board thought it made more sense to form a new fire district and purchase enough equipment to cover both Barneveld and Brigham. As you can see, we are missing some of the history of the department, but we hope you will take the time and help us fill in the rest. Please send us dates, pictures, and events that can help us fill in the gaps so we can preserve the department’s rich history for years to come. Please contact the chief at: khurlbert@barneveld-brighamfire.com if you have additonal history information to share. Note: The following is an excerpt from John’s book Weehaukaja: A History of the Village of Barneveld and the Town of Brigham, Volumes 1&2, August 1976-77. Fire is always a danger in any community and Barneveld hasn’t been exempt from this problem. 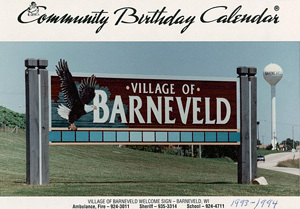 When Barneveld was established in 1883, the fire hazard was considered part of life that little could be done about. In 1885, a fire destroyed the Dan Davis building and the contents of the several stores that occupied it. Despite the $15,000 loss, a lot for those days, nothing was done to decrease the danger from fire. It shall be the duty of every furnace owning person in the Village of Barneveld that has a chimney or chimneys, to have such chimney or chimneys cleaned at least once a year. It wasn’t until a fire in 1937 prompted the citizens of Barneveld to think about acquiring some type of fire protection. 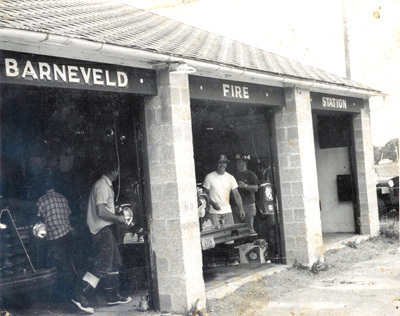 In May 1937, the Barneveld Volunteer Fire Department was organized and a water system was built to supply firefighters with a means to battle fires throughout the community. In 1937, the village bought a 1927 Stoughton pumper truck from Mount Horeb. In 1946, a new Chevrolet pumper truck was purchased with the money raised by the community through bake sales, dances, etc. 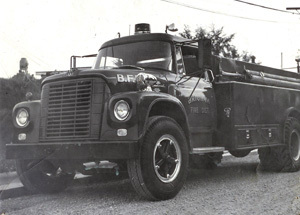 In 1965, the Village of Barneveld and the Town of Brigham shared the cost of a new tanker to fight rural fires. In 1977 plans were made and approved to build a new village hall that would house a new fire station. The cost of this will be shared in various degrees by the village, the Town of Brigham and the Federal Government. Over the years, the fire department has fought house fires, barn fires, grass fires, and forest fires. In 1953, they worked with several other volunteer fire departments for almost a week to contain a fire on Blue Mounds. In 1965, they were unable to prevent the burning of the Barneveld Motors building, but kept it from spreading to other buildings. In January, 1975, the department fought the fire at the Masonic Temple. 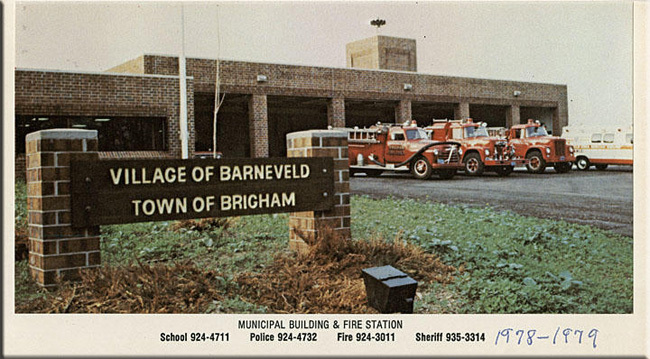 To this day, the Barneveld-Brigham Fire Department is comprised of a dedicated team of community volunteers who serve the community to the best of their abilities by pledging to protect our citizens, visitors, and their property whenever the need arises.